As I was catching up on photos from the past week, this one stopped me. 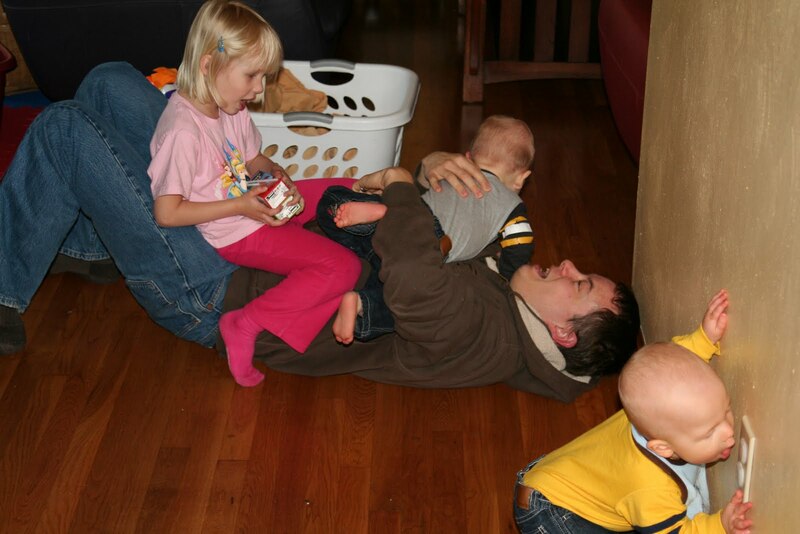 There is so much happening in this picture – it captures a lot of what it is like to have 3 young children. The picture was taken in the evening after picking up the kids. The boys had finished eating dinner and were having their wild time before bedtime. Scott sat on the floor to play with them and was soon surrounded by all 3. The boys don’t stay in one place for long – Wyatt was making his getaway, Ruslan had already escaped and was getting into trouble. I don’t know why Juliana has 2 juice boxes in her hands. A basket of clean laundry in the background…yep, just another normal evening at our house.